MALACAÑANG – Executive Secretary Paquito N. Ochoa Jr. has exhorted prosecutors from the Department of Justice (DOJ) to complement the administration’s efforts in restoring investor confidence and managing the economy by ensuring an efficient criminal justice system. 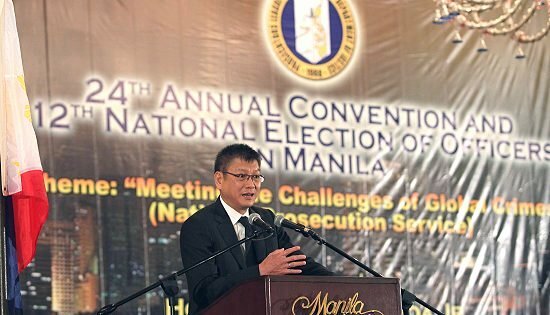 Speaking at the 24th National Convention of the Prosecutors’ League of the Philippines recently, Ochoa underscored the need for the DOJ and its prosecution arm, the National Prosecution Service (NPS), to help establish the Philippines as “a nation where justice and the rule of law prevails” to make it more attractive to investors. “We have to do our share to inspire confidence among businessmen, who want a return on their investment, and seek security for their persons and their properties,” Ochoa stressed. As the country’s economic revival making the headway, Ochoa said it was important for those in the criminal justice system to step up in order to match the plans and programs of President Benigno Aquino III and his economic managers. “While it is their job to encourage foreign investors to bring business into the country, it is the job of those involved in law enforcement, like the DOJ and NPS, to discourage international criminal syndicates from operating in this country and victimizing our people,” Ochoa added. Ochoa likewise urged prosecutors to emulate the President’s example and brand of leadership in providing justice and accountability to the Filipino public. “The President has chosen to lead by example and has been unequivocal about ensuring that our people obtain justice, so those tasked to enforce our laws – including those in the prosecutorial service – must be emboldened to ensure that those who break our laws do not profit from their crimes, but are made to pay for them,” Ochoa said. At the same time, Ochoa cited tremendous achievements of various government agencies in terms of international crime-fighting and prevention. Ochoa said the Presidential Anti-Organized Crime Commission (PAOCC), which he heads, had been vigorously coordinating and aligning the efforts of government agencies tasked to combat organized criminal activities. The Executive Secretary said the initiative of the Inter-Agency Council Against Trafficking – composed of PAOCC, DOJ, Philippine Center for Transnational Crime, Commission on Filipinos Overseas, Department of Labor and Philippine Overseas Employment Agency – resulted in the rescue of more human trafficking victims during the last two years. This accomplishment was the main reason why the United States removed the Philippines from its “Tier 2 Watchlist” last year, he said. According to Ochoa, much credit goes to the DOJ and Justice Secretary Leila de Lima, who has taken the lead in the government’s anti-human trafficking efforts. “The DOJ played a major role in the success of our anti-human trafficking efforts as it tied together the efforts of numerous agencies to thwart human trafficking syndicates and build solid cases that led to the convictions of the criminal elements responsible,” Ochoa said. “For legitimate businessmen who wish to invest in our country and want a good return on their investment, we will roll out the red carpet and make lives easier for them; for criminals who want to engage in profit from illegal activities within our borders, we will make business bad for them and will use all the resources of the state so that they are caught, tried and punished for their crimes,” Ochoa said. “In these efforts, know that you have the support of a President who believes in walking the straight path, righting the wrongs in our country, and upholding the rule of law to provide an environment that will spur inclusive economic growth and genuine national development,” he added. MANILA – Congressmen led by House Speaker Feliciano Belmonte are no longer keen on investigating anew the officials of the Philippine Amusement and Gaming Corporation (Pagcor) who got caught up in a fierce intra-corporate legal war between two gaming giants in the US. Meanwhile, Speaker Belmonte and other senior members of Congress said that instead of being subjected to unending investigations, Pagcor Chair Cristino Naguiat Jr. deserves to be supported for doggedly pursuing the US$ 5-billion Entertainment City project, which got him and other Pagcor officials into trouble in the first place. “As far as I can remember, the committee on games and amusement had a hearing and no less than the panel chair (Manila Rep. Amado Bagatsing), together with his members, cleared Chairman Naguiat. If ever the resolution seeking another probe reaches committee chair Amado Bagatsing, I’m sure he knows what to do,” Belmonte said. Belmonte was commenting on a fresh investigation sought by Bayan Muna party-list Rep. Teddy Casiño on reports that Naguiat and other Pagcor officials got luxury rooms, sumptuous dinners and other perks at the Wynn’s Resorts in Macau in 2010, courtesy of Japanese casino mogul Kazuo Okada. Although Casiño’s resolution asked the House committee on good government and public accountability to do the investigation, the matter is likely to be tossed back to Bagatsing’s committee. When sought for comment, Bagatsing described Casino’s resolution as similar to “forum shopping” in the legal practice. Forum shopping is the informal name given to the practice adopted by some litigants to have their legal case heard in the court thought most likely to provide a favorable judgment. The practice is disallowed in the Philippine Justice system. “It indeed looks like forum shopping to me,” said Bagatsing, whose panel cleared Naguiat and his Pagcor delegation of supposed impropriety, saying that Pagcor officials were mere cannon fodder in the messy corporate legal wrangling between Okada and his partner of 12 years, American casino magnate Stephen Wynn, chair of the Wynn Resorts. “There is no impropriety here. We are falling into the trap and machinations of Mr. Steve Wynn whose main objective is to oust Okada from his casino firm,” Bagatsing said during the February 27 hearing where Wynn was also declared persona non-grata and banned from doing business in the country. According to Bagatsing, Naguiat was merely working to ensure the success of Entertainment City which could generate $10 billion in gross revenues from 2015 and 2016 when investors led by Okada’s Travellers International Hotel Group and Tiger Resorts and local investors shall have completed the integrated hotel, amusement and gaming project in Paranaque City. “I hope we will get the picture right, that Mr. Naguiat was a collateral damage,” said Bagatsing, adding that the project that Okada is entering with Pagcor in the country may dwarf the gambling operations in Wynn’s casinos in Las Vegas and Macau. During the hearing, Naguiat said he was only doing his job when he honored the invitation of Okada in a bid to create more jobs in the country. True to Bagatsing’s suspicions, Wynn did indeed oust Okada from the Wynn Resorts board by redeeming Okada’s 24 shares in the company at 30 percent discount and issuing a 10-year $1.9-billion promissory note. Wynn did so by presenting to the board an investigation showing Okada committing alleged impropriety with gaming regulators in the Philippines in violation of US anti-corruption laws. But Belmonte said that instead of letting the Wynn-Okada messy legal corporate battle affect the country’s chance to become the world’s newest gaming and tourism mecca, Naguiat should be supported for pursuing the ambitious multi-billion project. “I am supportive of Pagcor’s Entertainment City project. It will definitely boost our country’s tourism,” Belmonte said, noting that Tourism Secretary Ramon Jimenez earlier expressed optimism that Pagcor’s Las Vegas-style facility would help the government achieve its targeted 10 million annual tourist visits by 2016. Once it becomes fully operational by 2015, Pagcor’s Entertainment City is expected to generate at least 1,000,000 tourist arrivals annually contributing at least 10 percent of the government’s target tourist arrivals within the next few years, with annual gaming revenues estimated to be at least US$10 billion of which 25 percent, or at least US$ 2.5 billion annually, will be the share of government. “This will bring much more fun in the Philippines, in terms of tourist arrivals and gaming revenues for the Philippine government,” Belmonte said. Okada, chairman of Universal Entertainment Corp. and Aruze USA Inc., had likewise filed a counterclaim against his partner Wynn for Okada’s ouster and the arbitrary redemption of his stake in the Las Vegas-based gaming firm. In moving against Okada, Wynn said Okada’s two casinos and three hotels in Manila will lure “high-limit, VIP gamblers” from China in direct competition with Wynn’s casino in Macau. TACLOBAN CITY – Leyte’s two winning festivals, the Lingganay Festival of Alangalang and Buyogan Festival of Abuyog, each received a whopping P1 million assistance from the provincial government of Leyte as they vie in the country’s premiere festival, the Aliwan Fiesta in Manila. Gov. Carlos Jericho Petilla handed over the financial assistance to Mayor Loreto Yu of Alangalang and Mayor Octavio Traya of Abuyog, as there is only a little over two weeks to go and preparations, for both festivals are now in full swing. The Manila Broadcasting Company will hold the 10th edition of the Aliwan Fiesta 2012 on April 12-14 at the Quirino Grandstand in Manila. Gov. Petilla said he is more than ready to provide support to these two festival contingents as exposures in such a national festival competition also lures economic opportunities and tourism promotions. “It is very, very expensive to be sending a contingent. But we have already made a mark in this cultural festivities that whenever they mention Leyte, they would always associate us with award winning festivals,” Gov. Petilla said. Alangalang’s Lingganay Festival earned a spot to compete in the Aliwan Fiesta after winning the grand plum in the 2011 Pintados-Kasadyaan Festival of Festivals in Tacloban. Its first entry into the Sinulog Festival in Cebu this January also proved fruitful as it won first place in the Free Interpretation category. On the other hand, Abuyog famed Buyogan Festival will again try to work its magic in the Aliwan Fiesta. Buyogan did not compete in the Aliwan last year and the Sinulog Festival this year after a winning streak in 2009 and 2010, including in the Pintados-Kasadyaan Festival. This year twenty one festivals will be seeing action in this yearly summer spectacle that include Kalivungan Festival of Alamada Cotabato; Ala Eh Lambayok Festival of San Juan, Batangas; Pattaraday Festival of Santiago City, Isabela; Kalilangan Festival of General Santos City; Boling-Boling Festival of Catanauan Quezon; Zamboanga Hermosa Festival of Zamboanga City; Dayang Dayang Festival of Pasay City; Halamanan Festival of Guiguinto Bulacan; Lembuhong Festival of Surallah South Cotabato; Salakayan Festival of Miag ao Iloilo; Padang Padang Festival of Parang Maguindanao; Panagbenga Festival of Baguio City; Tagagiik Festival of Taguig City; Meguyaya Festival of Upi Maguindanao; Mamang-os at Kambingan Festival of Tuy, Batangas; Sagayan Festival of the Province of Maguindanao; T’nalak Festival of the Province of South Cotabato; Dinagyang Festiv al of Iloilo City and Pandang Gitab Festival of the Province of Oriental Mindoro. The highlights of this grand event is the festival streetdance competition and the float parade. The Aliwan Fiesta, which was organized in 2003 by the Manila Broadcasting Company (MBC) and Star City, showcases the best festivals of the 17 regions in the country. TOLOSA, Leyte – The fisherman from Tolosa, Leyte who was reported missing since he went out fishing on March 27 at the height of heavy rains, was found on March 29, right on time to attend his wedding on March 30. “Yes, he was found. I am sure of that. I just officiated his wedding this morning,” Tolosa Mayor Erwin Ocaña told the Philippine Information Agency. Mayor Ocaña described as very emotional, the wedding of the lost fisherman Castro C. Advincula, 48 years old and his girlfriend from Iloilo. Based on official records of the Tolosa DRRMC, Castro Advincula, Romeo C. Maraya, 47 years old, Romeo Maraya, Jr., 14 years old, and a certain Dodo Calamaya, 60 years old, all residents of the municipality of Tolosa went fishing early morning of March 27. Supposedly, based on their daily routine, they were expected to return home between 11:00 o’clock to 3:00 o’clock in the afternoon. Unfortunately, the four fishermen failed to return. On March 28 at about 12:00 o’clock noontime, the three fishermen arrived home safely without any injuries, but without Castro Advincula. Upon learning about this the office of the Mayor immediately informed the MDRRMC which reported the same to RDRRMC, and conducted search and rescue operations to no avail. The PNP of Lawaan, Dulag, Mayorga and Abuyog were also contacted for help, in case the fishermen in the said municipalities will spot the fisherman in distress. In the morning of March 29, the Tolosa MRRMC conducted search and rescue operations on the nearby waters up to Abuyog, but came home with negative results. On March 29, at about 12:05 noontime, Castro C. Advincula arrived home safely without any injuries except for minor elevation of his blood pressure. He was accompanied by two fishermen from San Roque, Abuyog, Leyte namely, Nestor Felicarta, 53 years old and Ernesto A. Mendras, 57 years old. The two Abuyog fishermen were on their way fishing within the territorial waters of Abuyog bounded by the territorial waters of Silago, Leyte, at 5:00 o’clock in the morning of September 29 when they spotted and rescued Castro Advincula. Castro thanked the two fishermen profusely for coming to his rescue and for bringing him home in time for his wedding at 8:00 o’clock in the morning of Friday. Lee is a popular TV host, and heads the Global Resource Center (GRC) in Seoul, a non-government organization serving as a support group for foreign wives of Koreans. She became a naturalized Korean in 1998, three years after she married Korean Lee Dongho and moved to South Korea. The ruling Saenuri Party included her in the list of 46 candidates for the proportional representative seats in the April 11 elections in South Korea. Lee, who was present during the Vice-President’s dialog with the Filipino community at the Philippine Embassy, wrote down the concerns raised by the OFWs, among them the plight of “Stateless children,” or children born to migrant parents who are not recognized by the host countries. “What we can do is to appeal to the host governments to recognize these children. 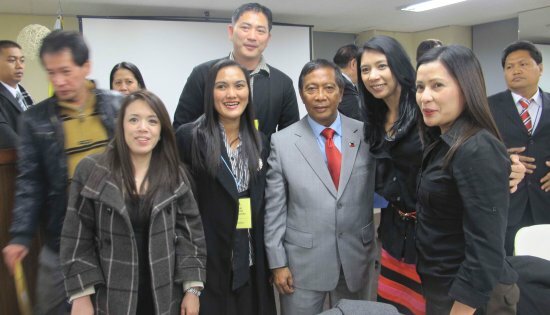 But the problem is not only confined to South Korea but in other countries, especially in the Middle East where there are an estimate 6,000 of them,” Binay said. TACLOBAN CITY – Women comprise 91.3 percent of the 165,136 beneficiaries of Pantawid Pamilyang Pilipino Program or 4Ps, in Eastern Visayas in 2011. This was disclosed by the National Statistical Coordination Board Region 8 Coordinator Evangeline Paran who said that men accounted for only 8.7 percent. Hence, 9 out of 10 beneficiaries of 4Ps in the Region are women, Director Paran said adding that all provinces in the Region exhibited similar trend. In the province of Leyte, of the total 74,261 household beneficiaries, a total of 68,456 were women while 5,805 were men. In Biliran, of the total 3,287 household beneficiaries, 3,077 were women while 210 were men. In Southern Leyte, of the total 2,128 household beneficiaries, 1,941 were women while 187 were men. Moreover, in the province of Samar, of the total 45,922 household beneficiaries, 42,731were women while 3,191 were men. Eastern Samar had 5,423 household beneficiaries; 5,028 were women while 395 were men. Of the 34,115 Northern Samar, 29,527 were women while 4,588 were men. The implementing agency of 4Ps, the Department of Social Welfare and Development has an answer to the trend. According to DSWD, women were chosen as household beneficiaries over men because the monthly cash grant is usually given to the most responsible member of the household, Director Paran said. Pantawid Pamilyang Pilipino Program, also known as Conditional Cash Transfer (CCT), is a poverty reduction program of the government which provides cash assistance to poor households to improve their health, nutrition and education status, particularly of children aged 0-14 years old. A household that has children 0-14 years old and/or has a pregnant woman at the time of assessment is one of the criteria in the selection of beneficiaries. The Regional NCMB observed that the number of pregnant women served totaled 4,862 in 2011 and almost half or 49.6% came from the province of Leyte. One of the conditionalities of 4Ps is that pregnant women must avail of pre-and post-natal care and be attended by a trained health professional during childbirth. Meanwhile, the number of schoolchildren beneficiaries reached 412,964. There were more boys (213,810) than girls (199,154) enrolled in daycare, elementary and high school. The 4Ps conditionalities include that 0-5 years old children must receive regular preventive health check-ups and vaccines; that 3-5 years old children must attend day care or pre-school classes at least 85% of the time; that 6-14 years old must be enrolled in elementary and high school and must attend at least 85% of the time, and that 6-14 years old must receive deworming pills twice a year. The Communist Party of the Philippines (CPP) today dismissed the possibility of declaring a Lenten ceasefire because of the continuous brutal offensives and campaigns of suppression being carried out by the Armed Forces of the Philippines (AFP) against civilian communities and the Aquino regime's policy to paralyze peace negotiations with the National Democratic Front of the Philippines (NDFP). "The brutality of the Aquino regime's war in the countryside has stepped up in the past few months, with state forces resorting to aerial bombings, massacres and shootings directed against unarmed people waging struggles against oppression and exploitation," said the CPP. "Peace talks and human rights are completely out of the list of priorities of the US-Aquino regime as shown by the intensified atrocities being carried out by its armed forces under its Oplan Bayanihan war of suppression," said the CPP. "The attacks against civilian communities have resulted in grave abuses of human rights, including violations of children's rights," added the CPP. "The grossest violations of human rights are being committed against civilian communities waging struggles for land and against the incursions of foreign mining firms." "With Oplan Bayanihan and attacks against civilian communities, the US-Aquino regime and its armed forces clearly demonstrate how subservient they are to the interests of big landlords and the exploitative and oppressive foreign monopoly firms," said the CPP. From March 8 to 11, the 4th ID of the AFP carried out aerial bombings of the mountain communities of Agusan-Surigao, dislocating lumad communities and putting civilian lives in grave danger. The bombings, which were meant to pave the way for mining companies and terrorize the people, affected Barangays Puting Bato in Cabadbaran City and two lumad communities in Kalatingga and Manhumapay along the Agusan del Norte, Surigao del Norte and Surigao del Sur tri-boundary. On March 11, seven-year old Rudelyn Aguirre of the Tumanduk tribe was killed by a grenade launched from the 61st IB detachment located just 200 meters away from her family's house. The explosive hit the front yard of Divina and Roberto Aguirre in Barangay Tacayan, Tapaz, Capiz where Rudelyn and her sister Roda were playing. Roda was severely wounded in the explosion. Late last February, AFP soldiers, PNP personnel and a hundred armed goons of the Rizal Commercial Banking Corporation fired at protesting farm workers of Hacienda Luisita. The peasants and farm workers were demonstrating against the construction of a wall to fence off more than 200 hectares of land being claimed by RCBC. The land has been awarded to the farm workers by the Supreme Court in a decision last November 22, 2011. On February 25, soldiers of the 49th IB massacred the Mancera family when they indiscriminately fired upon their hut in Sitio Mapatong, Barangay Malaya, Labo, Camarines Norte. Three members of the Mancera family – Michael, 10 years old; Richard, 7; and their father Benjamin, died on the spot. A lone NPA Red fighter, Rafael "Ka Gupi" Llantino, who was resting with the family, was also killed. On February 16, armed elements of the 1st IB, 1st Special Forces Battalion, 59th IB and CAFGU-CAA indiscriminately fired upon a group of hunters in the forested area of Magdalena, Laguna. Two residents of the area immediately died. Earlier, Romeo Guyala, a barangay tanod, and his son Romeo Jr, were subjected to beatings by elements of the 1st IB and the 202nd Brigade in Liliw, Laguna.